It's not much of a pub, but it is cheap, so boo hoo! 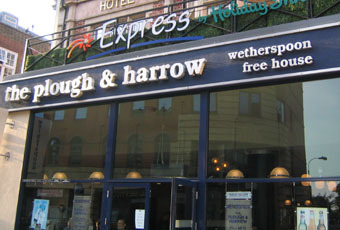 Let's start off with the obvious- it's a Wetherspoons. You know what to expect- beer, and price wise. No real surprises. The staff are decent. Some more talkative and friendly than others. One big plus here is that the food is always decent or better. The steaks and curries are especially recommended. The 'WC's' are, appropriately, commodious. And lastly, you rarely, if ever, get any trouble there. Well worth a visit if all you want is a decent pint, and perhaps a spot of grub. Walked in, stood at bar, completely ignored, walked out. Deceptively large 'Spoons. Quick service, decent beer, have a drink then move somewhere else. Like virtually every other JDW it knows its clientele and caters for them.